So the big part is finally coming. Let’s tell the story about how new The Clock 4 came to be. 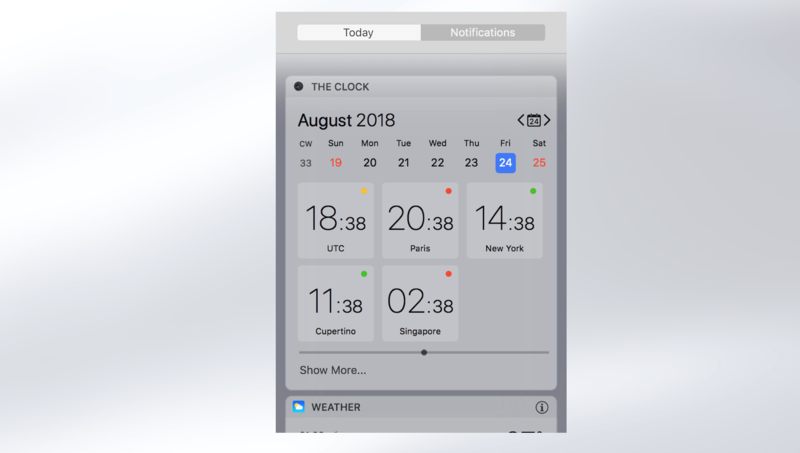 2 years ago, I wanted to bring The Clock to iOS, but there was many challenges and I needed to overcome these challenges. 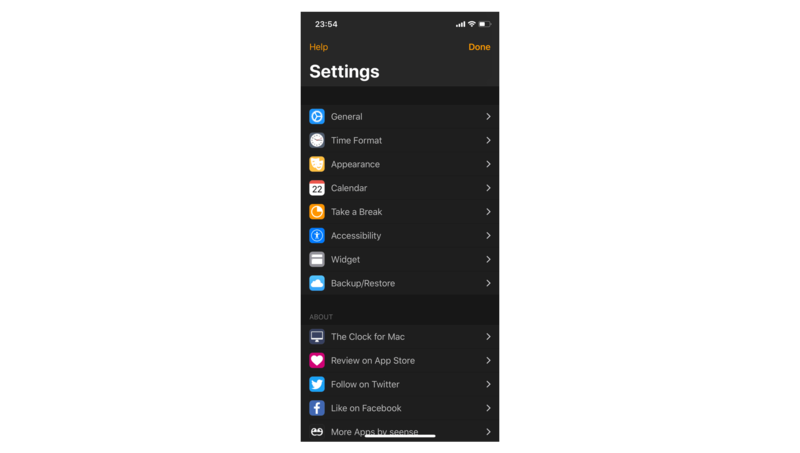 The first challenge being, The Clock is mainly a menu bar app, how to bring The Clock to an iPhone or an iPad without doing this kind of thing? I wanted an iPhone/iPad full experience. Not a simple macOS port. You should be able to turn your iPhone and use the landscape view for something more, for something different. I definitely did not want the iPad view being a simple stretch of the iPhone portrait view. So as you can see many questions raised at the time. The second challenge, I wanted to minimize the difference of code between macOS and iOS. The 2 platforms core development kits are similar but different enough to lead to a huge amount of works. So I needed to find a solution for this too. These 2 challenges, took me time, before finding a solution which I think is today working well. Many trials and errors. Coding, designing, going back to the board and many back and forth. This was a big part of the first 6-8 months. Because I was never happy with my choices, I was maybe not ready to go all the way. So, you guess which one I took… Yes I went all the way down the rabbit hole. My focus was to keep a familiar interface, as The Clock is used by tens of thousands of you on daily basis. While creating a complete new kind of “responsive app” which should react and adapt to any window or device size. And all being supported by Core Animation, Auto-Layout and other recent powerful Apple frameworks to leverage the best UI experiences. 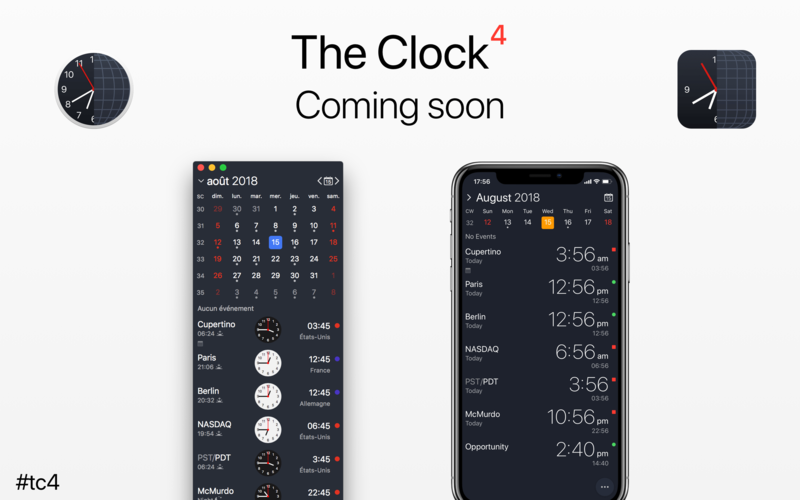 When I took this direction for the new The Clock 4, I realised that I had found a nice solution and that at the same time I could bring many features that customers wanted but could have never being incorporated in the previous versions, due to the static window size. Here is a little video of the result. Hope you like it. Few examples. As the design should react and adapt the any window size, this means that obviously you should be able to resize the window 😉. Resizing the window will solve the issue of long city name. It means as well that I could implement a similar iOS Dynamic Type to the macOS. It means as well you could have a horizontal display of the world clocks. for the users having big external display and who want to see this kind of view. It means that you can enjoy working with The Clock in a Split View or FullScreen. It means I could create an additional extended meeting planner. So yes The Clock 4 has in its core being designed fully responsive. This way it can gracefully adapt to any device size or any window size. 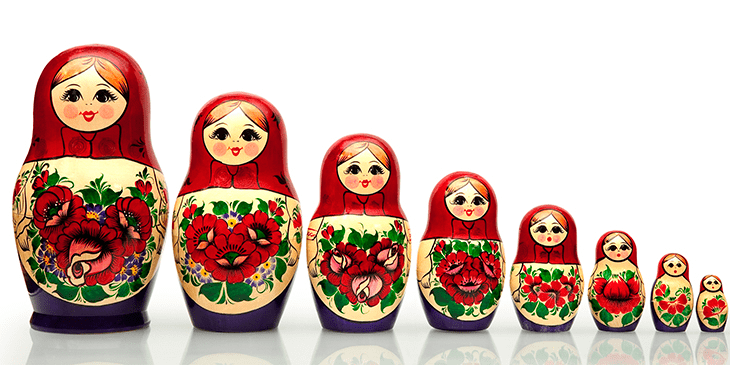 I always thought The Clock has being structured as a Russian Dolls. Meaning you have everything working when you open it, nothing to tweak or complicated. But if you want, you can go further and activate more features which are suitable to you. This new version bring the concept to a all new level. With of course a beautiful meeting planner for the Touchbar, where you can set your meeting, select the cities. Or simply quickly view the time of the different cities. More in the last and final blog post next week. Before to enter the big part (Part 3) of this blog series, I will show you for this second part some nice new goodies coming in The Clock 4. The first features will be macOS only. One of the nice feature that users wanted for a while was the ability to define their own date and time format in the menubar. No more waiting. The Clock 4 in macOS is coming with this feature. Simply enter in the custom format any date/time with the RFC 3339 date/time format, and The Clock will display it. 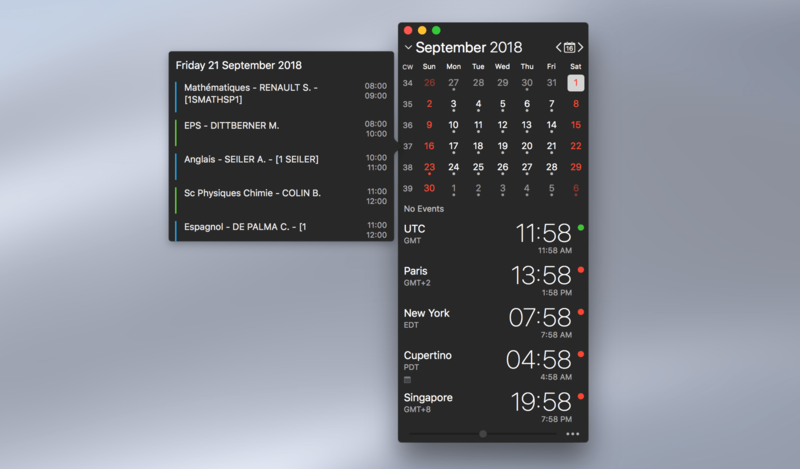 I wanted The Clock 4 to leverage this new interface provided in the recent MacBook Pros. First, I had to buy one of those baby 🤪. I could have developped this part without buying one and tested it in a simulator, but I wanted to be able to experience properly the Touch Bar, in order to deliver the best experience for The Clock 4. As you can see you can access all the functions of The Clock. The idea being, you need to be able to control all the part of The Clock from the keyboard shortcuts and as well from the Touch Bar. With a strong emphasis on the Accessibility. NB: The meeting planner will be shown in the next blog post as part of it is part of a big new feature. Of course all the design of the icons are in line with the menu on the iPhone/iPad version, for a seamless experience accross devices. 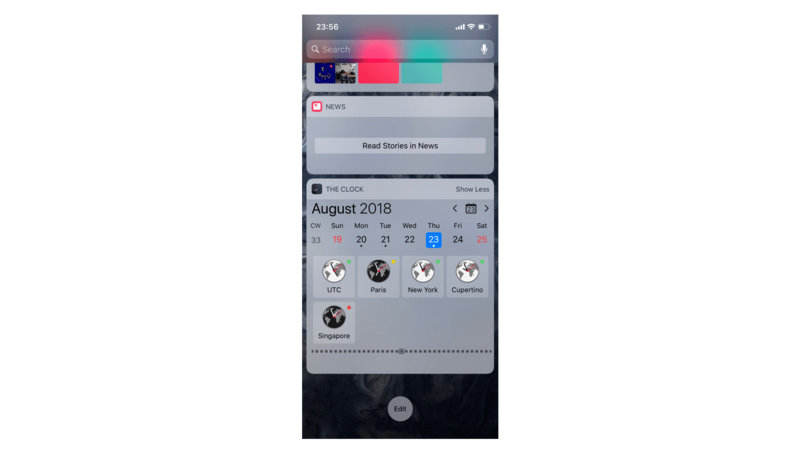 The notification center widget was as well a long time request, and is finally coming too 😁😎. Here under are what it looks like in macOS and iOS. And of course as everything in The Clock you can fine tune what to display in the Notification Center. 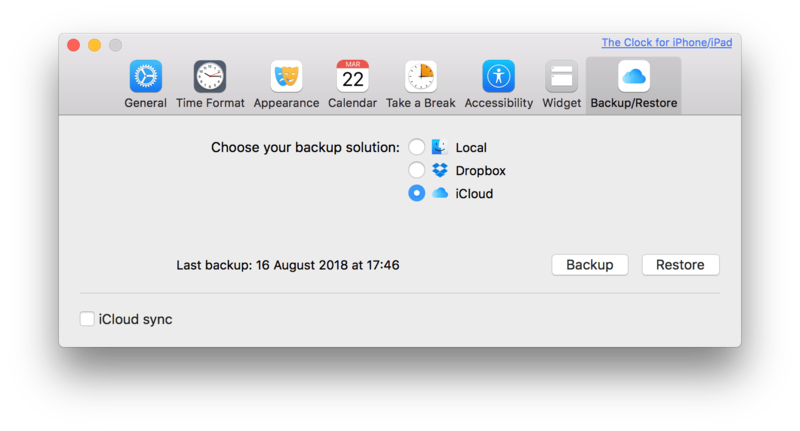 Following my last blog post users asked me if iCloud was coming a long side with DropBox backup in this new release. Answer: Yes. 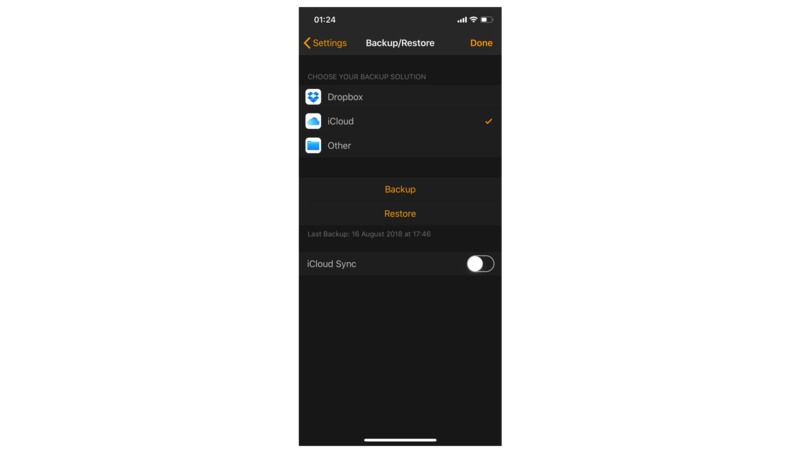 Here is the new Backup/Restore interface. After 2 years in the making The Clock 4 is finally here. Over the next few days, I’m going to take you to a journey, unveiling the biggest update ever of The Clock, which leaded to The Clock 4. I have a lot to cover. How much to cover you say? 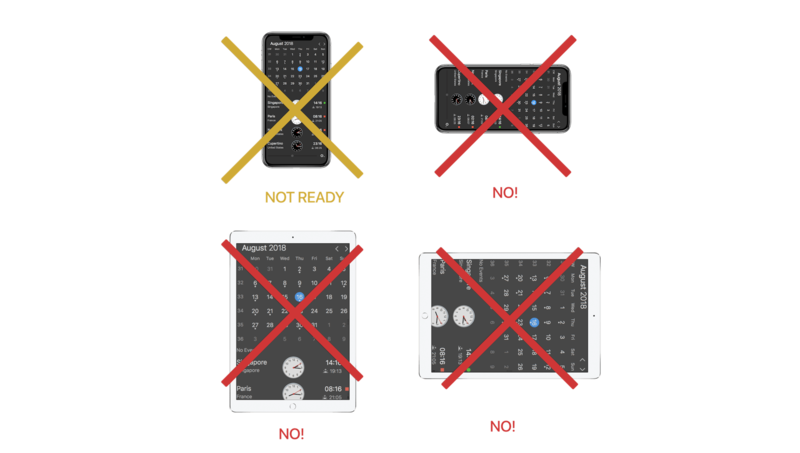 To give you an idea, The Clock 4 has around 100 optional settings to match your need. Of course, I will not detail all of them, but I will unveil the major ones over the course of the next few days (~1 week). With at the end of this journey the release of the beta. Before to describe all the redesign processes, struggles, issues, many times the rewrite of the code. In this first post, I will simply start slow. I will show the small UI differences between The Clock 3 and The Clock 4. Big clarification before to start this journey. The Clock 4 refers to either the macOS version either the iOS version. As for a seamless experience, there is 99% features compatibility. Obviously not the menubar part 😉. As you probably know The Clock is designed to be beautiful & simple yet a powerful productivity tool all at the same time. The Clock is composed of 4 parts. And these parts can be shown or hidden as per your need. The themes have a better color contrast. The font differents sizing are more inline with what you could see with the iOS Dynamic Type font sizes. The selected day is now with a nice rounded square. While the calendar is shown, you can now expand/collapse the calendar with 6 weeks (as before) or 1 week. Usuful for the smaller screens if you want still to see the calendar but do not want it to take too much space. 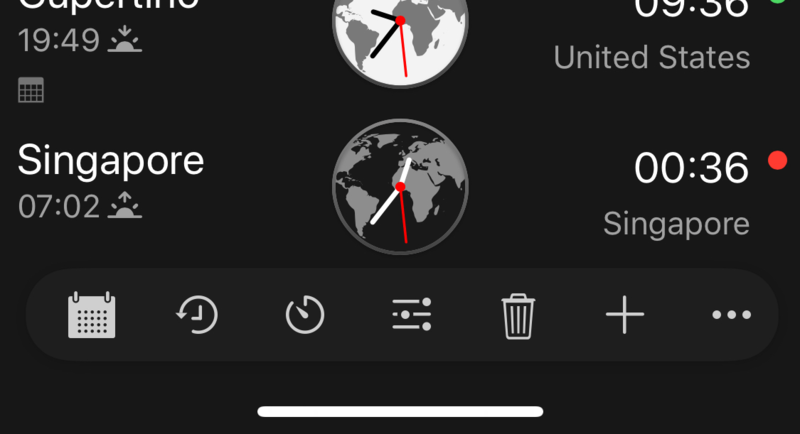 The world clocks complications (more than before) can now be placed on the left or right. The full complications list is avaiblable for both sides. The meeting planner slider panel now display the date/time directly in the panel. And the panel now have a share button clearly shown, to share your meeting information. Previously you had to click to get the contextual menu. Which was maybe not obvious. The gear button has been replaced by a “more” button for a consistent UI between macOS and iOS. These are the major visual differences that you may notice when you open The Clock 4. Yes, on macOS, in the menu bar, now you can set your own custom format! While panning to set a meeting, you are not limited anymore to +/- 24h. The Clock 4 will automatically continue and change the date in the calendar. You may not have noticed, but you can now change the analog clock design. And few other goodies such as the new redesigned World Clock settings for a consistent experience across your devices. Or the new redesigned calendar events. 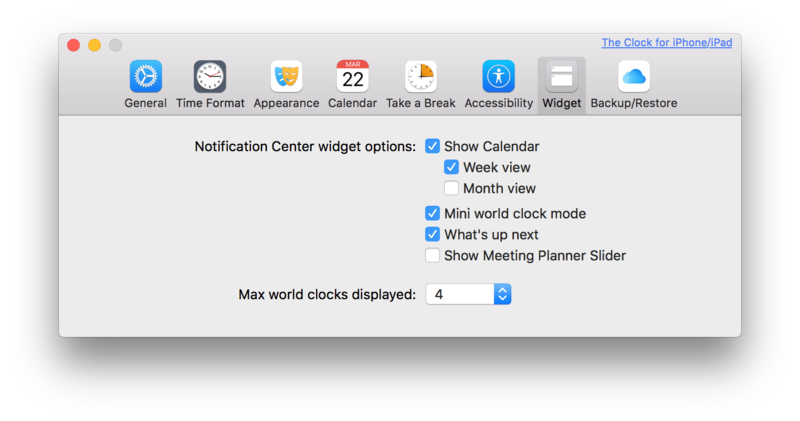 The World Clock settings and Calendar events are now shown with a double click/double tap, in order to better align the gesture between macOS and iOS for the display of a popover panels. These are really only a tiny part of the nice updates coming to The Clock 4. 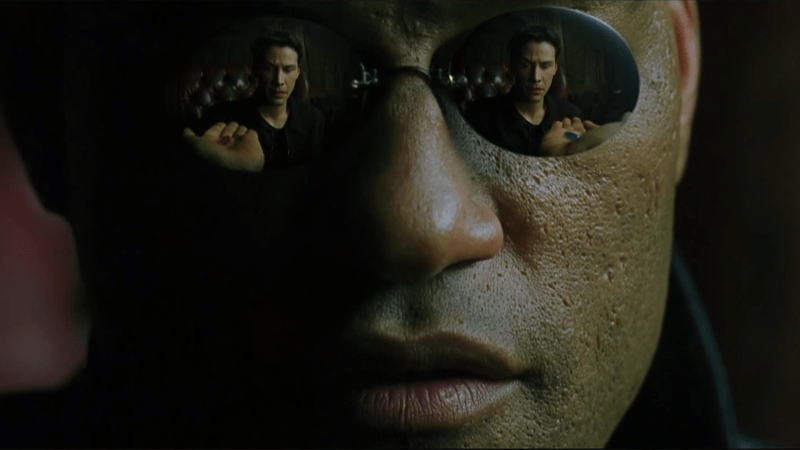 Be reminded that these blog posts will run for ~1 week. So I have far more to cover about this Bigger than Ever release. Oh! before I forget. All this nice UI has been completely rewritten and is now driven 100% by Core Animation and Auto Layout for smooth animations and optimum rendering 🤪. And is macOS 10.14 Mojave and iOS 12 ready. Little Game: A visual detail of The Clock 3/The Clock 4 macOS first screenshot has not been described yet, and it is a major one. Can you spot the differences between The Clock 3 and The Clock 4 macOS and tell me which one? 🤔. The new summer 2016 release of The Clock is here. And what a great release! The Clock was introduced back in 2012, as a very simple World Clock. 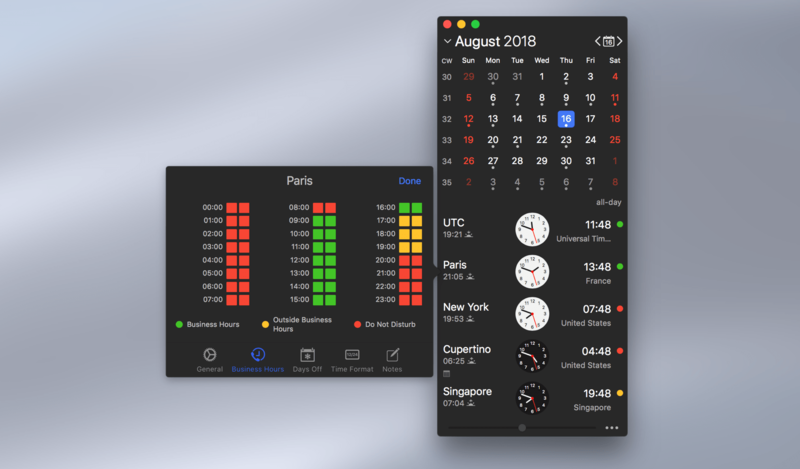 After 4 years of free upgrades, The Clock, the Best World Clock for Mac, has grown a lot and is now speaking more than 8 languages. I will focus on 2 of the gorgeous features on this blog post. The first great feature is Accessibility. 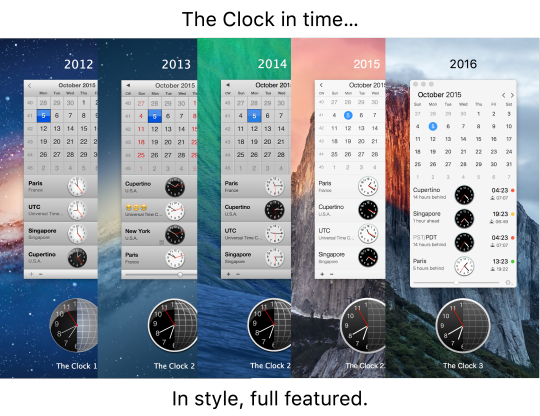 Starting from version 3, The Clock introduced slightly different icons to help the color blind community. Today I’m going even further in Accessibility. As announced on my last post, from now on, I’m going to make sure that my popular apps The Clock, MenuBar Stats are supporting VoiceOver . So, I’m pleased to announce today, that The Clock is the first seense app to fully support VoiceOver on a public release (thanks to Scott H. for the idea and testing). For the ones who read my last post, The Clock is a far more advanced app (hundreds of features) than MenuBar Stats, and it took a little bit longer to implement the VO feature properly. But it is now implemented, and working wonderfully. As of today VO speaks only in English, but everything is ready for more languages in the future releases. Another feature to improve the Accessibility, is the font size of the time displayed in your menu bar. By default the size is exactly the same as the Apple stock clock. But now you have the option to increase the font size. The second great feature, I want to talk about today, is for the Dreamers. Most of you are using The Clock to improve your productivity at work. Would it not be nice to dream a little bit as well? In The Clock 3.0 special cities, time zones were introduced for our navy friends. Today I’m going further with a new planet, Mars. I have included in The Clock database, all the major Mars sites from NASA Mars24. So now you will know easily the local time on Opportunity, Curiosity, Olympus Mons and other Mars sites. 1 hour on Mars is not exactly the same as 1 hour on Earth so for this I especially developed new code to manage this part. This new code is based on Dr Michael Allison and Dr. Robert Schmunk algorithms. As you know, The Clock comes with watch Complications. One of the Complication is sunrise/sunset. Would it be nice to know when the sun is going to rise on Curiosity?. This is now possible, with The Clock. These new “cities”, or I should say Mars sites, are fully seamlessly integrated to The Clock. So you can use the Meeting Planner ;), and other features as you would do with any other cities on Earth. This is an introductory feature, it will grow. If you have suggestions or corrections to be done on this new feature email me, Tweet,… as always I’m listening. NB: The mission time and mission sol are not yet part of this version. So this was the 2 major features I wanted to talk about. But as mentioned previously, there is plenty of new features. 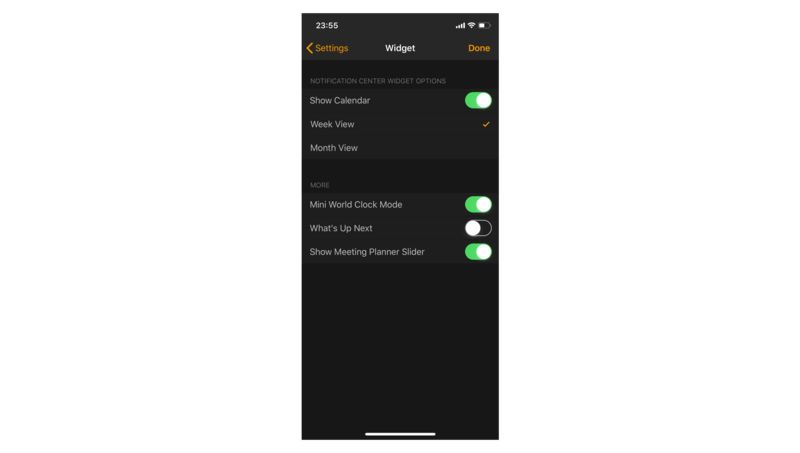 Such as Go to Date panel, Share menu, new Complications, Open your Calendar from The Clock events, simple Notes taking for a world clock, and more. The new macOS Sierra came out yesterday for the developers, I will start to test The Clock on this new release soon. For the next free major update this fall. If you like or love The Clock do not hesitate to write a nice review on the Mac App Store. It is helping me a lot. And as usual, if you have some suggestions or bug reports send me an email, it is more efficient for me to work on them. This is the title of a recent article from Ars Technica, and MacRumors. Basically the article is talking about vulnerabilities for man-in-the-middle attacks for apps using Sparkle framework. This framework is used by many developers to manage the update process of an app. At seense, I’m, of course, using this amazing framework for my apps sold outside the Mac App Store (The Clock, Barsoom, MenuBar Stats,MBRA2….). First of all, the group of developers behind the current Sparkle framework, pornel and the others, are very commited developers. Always trying to maximize the security of the product. This can be witnessed by the discussion on Github. This is why few months back they started to push for HTTPS a lot, to almost today deprecate the HTTP connection in their framework. And they are not the only ones. Last autumn 2015, Apple with their last OS X release, El Capitan, implemented what is known to the developers as App Transport Security (ATS). What is this? Basically an app compiled recently, by default cannot connect through HTTP to a server with El Capitan. This protection is not related to the sandbox. It is an extra protection. So today for a developer to release an app with HTTP connection, the developer must authorize it. Host by host or fully, which obviously increase the security risk. Now let’s talk about seense apps? Are they impacted? All my apps are stored on seense servers, the same server as my website. Last October 2015, I have announced that I moved seense.com to HTTPS. One of the main point was more secure app upgrade. Since last October 2015, all the apps from seense connect with seense server through HTTPS. And I leverage the ATS new security system to reinforce this on El Capitan. On top of this all the apps are signed with my Apple certificates. All the apps simultaneously sold on the Mac App Store and seense Store are sandboxed. So, the short answer is, seense apps are not impacted by this issue!. I did this post, because I started receiving emails from concern customers following the Ars Technica article. I guess, more of you may be concerned too. So, I want to say that seense apps are not impacted by this issue!. I take very seriously the security issues. And as explained previously, it was already anticipated last year. Added 20/02/2016: You can test yourself if your apps are vulnerable to the Sparkle framework by using the following script, proposed by the Sparkle developers. Back in August, I wrote that I had decided to re-write The Clock from the ground-up. I said that this decision was a big risk, due to the rule : Do not fix something which is not broken. Thousands of users, all over the world, rely on The Clock on daily basis for their work, or personal life. And I didn’t want to impact their work flow. Just 1 week before the release, as this was not risky enough, I decided to make this upgrade a free upgrade. Nice for my existing users, all existing users would be able to upgrade in 1 click. But if someting was wrong with this brand new version, all customers would have been immediately impacted. It was some worrying days. I went from beaking 1 big rule to let’s increase the risk even further! Almost 1 month after the #tc3 release, and a small maintenance release, for minor bugs. I’m relieved. After so may hours of designing, drawing, coding, and a finish line of adrenaline rush, I’m glad to see so many positive feedback from you. Either by customer reviews, either by email. Thanks. All this hard work paid off. Not by selling hundred of thousands of copies, this never happens for me, as I don’t make ads 😉 But paid off with your positive reviews and words by email. Which is my goal, and will always be my goal for my apps.